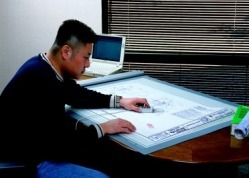 A digitizer is basically an electronic drafting table that can sense the position of an attached stylus or cursor and send that information to your computer. In modern digitizers, the board or mat section is embedded with thousands of thin wires. These wires are used to detect the signal given off by the stylus or cursor that is attached to digitizer. The digitizer then sends the position of the stylus/cursor to your computer via a cable. The position information includes information on the whether one of more the buttons on the stylus/cursor are being pressed as well as the position of the stylus/cursor in relation to the lower left corner of the digitizer. Some older digitizers used a clicking stylus/cursor and a pair of microphones to track the stylus/cursor. These digitizers are far less common now because of usability and accuracy issues. What are digitizers used for? Digitizers are primarily used to make measurements from paper plans or to "trace in" drawing information into a computer. Users include construction estimators, scientists, map makers, CAD operators, artists and pattern makers. Construction estimators use digitizers with either dedicated hardware, such as GTCO's QuikRuler or computer software programs, such as Tally System's QuickMeasure, to make area, length or count measurements for preparing construction bids. Scientists use digitizers to measure lengths, areas and counts from images. Map makers use digitizers to trace information into maps from photographs. Pattern makers use digitizers to trace patterns into computerized fabric cutters and printers. Artists use digitizers for creating and editing art. 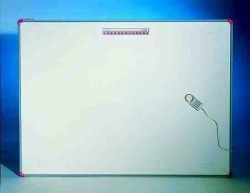 Large format digitizers are currently made by GTCO Calcomp and Numonics with GTCO CalComp the major manufacturer. Smaller digitizers are also made by Wacom, Genius, and Aiptek among others. How much do digitizers cost? Small digitizers that are used by artists start at less than $100. Large GTCO digitizers, suitable for working with construction blueprints or fabric patterns cost from $2200 to $2900 depending on the size. GTCO digitizers are also available on the used market for less. If you are considering purchasing a used GTCO digitizer, make sure that you purchase from a reputable dealer, that the digitizer is fully tested and that you can return it within a reasonable period if the digitizer is proves to be damaged in some way. What is a WinTab or TabletWorks driver? A driver for a digitizer is generically called a WinTab driver. WinTab stands for Windows Tablet driver. The WinTab driver that comes with GTCO digitizers is called TabletWorks. It is free and works with any digitizers manufactured by GTCO. These include all GTCO, Calcomp, Summagraphics and Scientific Accessories digitizers. The TabletWorks driver is available from the GTCOCalComp support website..
An alternative driver for unsupported digitizers, such as those made by Kurta, Atlek, Hitachi, LASICO and Numonics, is the "Virtual Tablet Driver". That driver is not free and is available from Digitizer Technology Company LLC. Copyright, 2009-2010. Dr Digitizer LLC. All rights reserved.